Alex George – Escape Reality, Read Fiction! It is 1904. When Frederick and Jette must flee her disapproving mother, where better to go than America, the land of the new? Originally set to board a boat to New York, at the last minute, they take one destined for New Orleans instead (“What’s the difference? They’re both new“), and later find themselves, more by chance than by design, in the small town of Beatrice, Missouri. Not speaking a word of English, they embark on their new life together. A Good American is narrated by Frederick and Jette’s grandson, James, who, in telling his ancestors’ story, comes to realize he doesn’t know his own story at all. From bare-knuckle prizefighting and Prohibition to sweet barbershop harmonies, the Kennedy assassination, and beyond, James’s family is caught up in the sweep of history. Each new generation discovers afresh what it means to be an American. And, in the process, Frederick and Jette’s progeny sometimes discover more about themselves than they had bargained for. 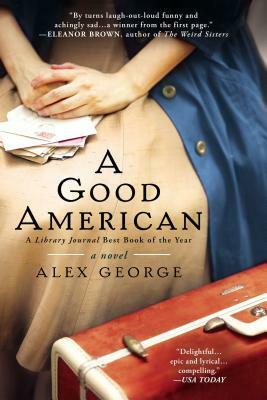 A Good American by Alex George is one of the quintessential, utterly and wondously American stories. It’s the schmaltzy Neil Diamond classic, Coming to America, played loud and proud in Fred’s Diner in Alex George’s Midwestern American town of Beatrice, Missouri. A Good American is the story of one family, the Meisenheimers from Hanover, Germany who come to the U.S. in 1904. And yet, the cadence of the story is every family’s story. And that’s what drew me in. James Meisenheimer is telling the story of his grandparents. Not just how they came to America, but why. The hopes and dreams they came with, and the dreams they left behind. The dramas and the heartbreaks that faced the first generation who came to America, in search of a better life for themselves, or at least for their children, and how well that worked, or how much they had to give up when it didn’t. How their compromises affected the next generation, and the next. Those “good Americans” they gave birth to in this new country that they found themselves in. We like to say that America is a nation of immigrants. All of us have stories like these behind us. For some of us, those stories are close. James story felt like, not just the story of his family, or the story of America. It didn’t feel distant, or fictional, or historic. It felt like my history and my history. Because, in a way, it is. Escape Rating A: Part of my fascination with A Good American was that I could hear my own voice telling some of these stories. Not the exact same ones, but the same type of stories. Like the fictional James, all four of my grandparents were European immigrants, and they all came to the U.S. in the early 1900s. Unlike James, my family did not come for romance, they came to the U.S. for much more prosaic reasons. But reading this story brought back memories of my grandparents and their lives, and family secrets that weren’t revealed until I was an adult–one almost as surprising as the one James discovers in the book. Sometimes it seems as if families are made up of their most colorful individuals, and the secrets in the dark. History, on the other hand, is made up of all of us, living our lives, and all of our families contributing their bits to the tapestry. We don’t know what pieces the ones who come after us will find interesting or amusing. We all have our parts to sing. ***Disclaimer: I was compensated for this BlogHer Book Club review but all opinions expressed are my own.